The miracle material of the twenty-first century? Like most good ideas, it all started with a pencil. Derived from the graphite that's been used to make the lead in your pencil for over 500 years, graphene has been hailed as the miracle material of the twenty-first century. It's the world's strongest, thinnest and most conductive material, but what is graphene and why is it so important? Theoretically possible since the 1940s, graphene was discovered and produced by Konstantin Novoselow and Andre Geim at the University of Manchester in 2004. Both scientists won the Nobel Prize in 2010 for their pioneering work, and since then the race has been on to make graphene a commercially viable industrial material. Super-thin, super-strong and super-flexible, the uniquely two-dimensional graphene conducts electricity better than copper and it conducts heat better than any other known material in thermal conductivity. Near-transparent sheets of carbon graphite molecules just one atom in thickness, graphene sheets are described as 'chicken wire made of carbon atoms'. In an industry that compares smartphones on how many millimetres thin they are, graphene is incredibly attractive. "It's estimated to take a million sheets of graphene to be just a millimetre thick," says Dr Kevin Curran, senior member at the Institute of Electrical and Electronics Engineers (IEEE) and Reader in Computer Science at Ulster University. "Any technology that can shave millimetres from a gadget is extremely valuable." Think flexible phones, super-efficient high-speed computing, and wearable devices with total pliability. "Flexible displays on phones are gimmicky to date, but flexible displays on true wearables have potential to transform the wearable space," says Curran. "Graphene is also transparent so this opens up the market to completely new wearables – and all would benefit from the incredible lightness of the material." Despite its lightness, graphene is reckoned to be 200 times stronger than steel. However, perhaps the biggest advance graphene could make to portable electronics is battery life. "It has the potential to enable lithium batteries to have more than 10 times the electrical capacity of current batteries," says Curran. That would make smartphones last over a week between recharges, and a Kindle as much as a year. It's with wearables and the Internet of Things that graphene could find its sweet-spot. Graphene increases the conductivity of radio-frequency identification (RFID) tags by as much as 50 times. Such tags are increasingly used to wirelessly transfer data, largely to track the location of freight, kids and pets. Back in May, scientists at the University of Manchester revealed a graphene antenna capable of delivering more powerful RFID tags and wireless sensors. 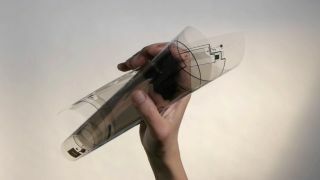 Made from compressed graphene ink, the antenna is flexible and can be printed onto paper or plastic – instead of a copper or aluminium-based RFID tag being attached to freight, cargo and luggage, it could be stamped on with ink at an airport check-in desk.